An elderly male had a syncopal episode. 911 was called. When medics arrived, the patient was alert and following commands. In the presence of the medics, he lost consciousness and became apneic and underwent 30 seconds of chest compressions, after which he started moaning and was again able to communicate and follow commands. No shock was ever delivered. Without a rhythm strip, this rhythm is difficult. In any case, there is bradycardia. There is either RBBB (see rSR' in V1) or there is a left sided escape rhythm that gives RBBB morphology. There is ST depression beyond the end of the wide QRS in I, II, aVF, and V4-V6, diagnostic of with subendocardial ischemia. There is no ST elevation. The patient was moaning upon arrival to the ED, looked ashen, and had agonal respirations. He was unresponsive to painful stimuli. He was in profound shock. The red arrows outline the right ventricle and the yellow arrows outline the left ventricle chamber. There is no pericardial fluid to account for shock. The RV is huge. This essentially rules out hypovolemia as the etiology (no GI bleed, no ruptured AAA, etc.). It makes pulmonary embolism (PE) very likely. It also makes large right ventricular infarct possible, but much less likely than PE. The small LV implies very low LV filling pressures, which implies low pulmonary venous pressure. RV pressure appears to be high (large RV), so there is obstruction between the RV and LV (PE). Alternatively, the RV is so ischemic as to be unable to generate high pressures (RVMI). This is much less likely than PE. The arrows show what I believe are P-waves. So this is third degree AV block. There is a wide QRS, so there is infra-HIS escape. It is RBBB morphology (left bundle escape). There is obvious ischemic ST elevation in V1-V3, maximal in V1. First, what kind of arrest was this? It was a PEA or bradyasystolic arrest, not a shockable rhythm. There is 3rd degree heart block. Although most cardiac arrest from MI is due to ventricular fibrillation, some is due to high grade AV block, and so this could indeed be due to large acute STEMI. Second: what does the ultrasound tell us about the condition? Is this an anterior (LV) MI? No! --The large RV and small LV on ultrasound make this a right ventricular process. A standard anterior MI would have a large LV with poor function, not a small LV. This LV is not filling. Third: what does the ECG tell us about the left ventricle? It is anterior, but is it anterior LV or anterior RV???? LV anterior STEMI does not give maximal ST elevation in V1. So this ECG is typical of right ventricular (RV) STEMI. Fourth: RV STEMI is almost always accompanied by profound inferior STEMI. Though there is some evidence of this in inferior leads, it is not convincing. 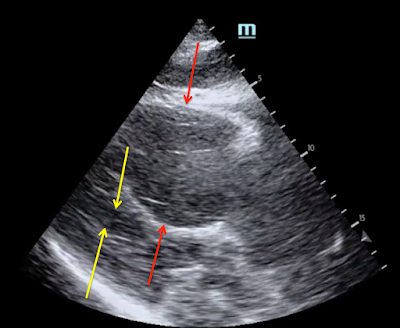 Therefore, the ultrasound looks like PE, and the location of the ST elevation tell us that it is an RV STEMI (which manifests in "anterior" leads, as they overlie the anterior RV). Fifth: the ultrasound in RV MI can look identical to that of PE: there can be both McConnell's sign and "D" sign, as well as enlarged RV with poor function. Sixth: Severe shock (e.g., due to PE) may result in STEMI (and, if anterior, it can be from anterior LV or anterior RV ischemia, or both) from low coronary pressure and flow, simply due to the shock. Here we have evidence of massive RV dysfunction. Seventh: When the severe shock that is the etiology of STEMI is due to PE, the ST elevation likely reflects the RV, as there is both low coronary flow in the RV marginal branch, and very high RV pressures (low supply and high demand). Eighth: STEMI even if from low flow, not ACS, can cause ischemia of the conduction system and result in complete AV block, even infra-HIS AV block. All of this favors PE with resulting RV STEMI, but initiated by PE. 1. If this had been a shockable rhythm, STEMI would be most likely. But it is bradyasystolic, so pulmonary embolism must be high on the differential. 2. The echo shows that, if this is MI, it is most likely an RV MI. It is not an (LV) anterior MI. 4. So is this an isolated RV MI with shock? Possible, but huge pulmonary embolism is more likely. In a patient with such a differential diagnosis, and in profound shock, near death, the treatment is IV thrombolytics. A 1/2 dose (50mg) of full dose (100 mg) bolus may be given when the patient is in extremis as this patient is. Such isolated RV STEMI is rare, but pulmonary embolism is not. Thus, this is most likely pulmonary embolism, not STEMI. However, thrombolytics will treat both. Lytics are very effective early in the course of STEMI. Moreover, their use does not precluded subsequent angiography and PCI if this turns out to be RV STEMI. The clinicians thought this was LV STEMI due to the "anterior" ST elevation. The cath lab was activated. In the cath lab, the coronaries were clean. Pulmonary embolism was suspected a right side cath with pulmonary angiogram confirmed it. There is now good flow in both trunks. Unfortunately, the patient was too ill to survive.